Print Book 970 pages in 2 volumes (printed book) with downloadable forms Note: For print books, with MCLE's supplementation service, new supplements and revisions are mailed automatically with an invoice. If you do not want to subscribe, please check the opt out option during checkout. 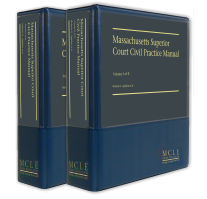 The Massachusetts Superior Court Civil Practice Manual is a cornerstone of MCLE's civil litigation collection. It has been cited by judges, referenced by hundreds of lawyers, and relied upon for solid and practical guidance through the stages of a case, from pre-trial to post-trial procedures. It offers a broad-based, intensive and practical grounding in the topics vital to trial practice in the Superior Court. You will benefit from the expertise of dozens of lawyers and judges, on topics such as developing top-notch trial advocacy techniques, navigating Rule 9 and its many details, perfecting discovery through your motions practice, presenting and excluding evidence at trial, and understanding the many requirements of dispositive motions. Ethics commentary, judicial insight, ADR perspectives are featured. Let the experts who authored and edited this manual help you to increase your effectiveness in Superior Court practice. Pretrial security. See chapter 4 for commentary on a 2016 case wherein it was held that in order to obtain a real estate attachment under Massachusetts law, a plaintiff must demonstrate (1) a reasonable likelihood of success on the merits, and (2) a reasonable likelihood of recovering a judgment equal to or greater than the amount of the attachment sought that is (3) over and above any liability insurance shown by the defendant to be available to satisfy the judgment. Anti-SLAPP. See chapter 6 for a sample defendants special motion to dismiss pursuant to the anti-SLAPP statute, and a 2017 case where the court articulated the object of a SLAPP suit. Reply memoranda to oppositions. See chapter 7 for a discussion of a recent departure from past practice with regard to the length of a reply and the recently revised Super. Ct. R. 9A(3). Preparation of discovery. See chapter 8 for a discussion of a recent rule change, where the Superior Court adopted Rule 20, concerning the court's order of "individual management and tracking so that the parties may secure a cost-effective means to resolve their dispute." These are only a few of the hundreds of updates available in this edition, which we at MCLE trust you will find valuable for your Superior Court practice and valuable in keeping your library current.